رضیئی, طیب. (1396). چشم‌اندازی از مناطق اقلیمی ایران به روش کوپن-گایگر در سده بیست و یکم. مجله ژئوفیزیک ایران, 11(1), 84-100. طیب رضیئی. "چشم‌اندازی از مناطق اقلیمی ایران به روش کوپن-گایگر در سده بیست و یکم". مجله ژئوفیزیک ایران, 11, 1, 1396, 84-100. رضیئی, طیب. (1396). 'چشم‌اندازی از مناطق اقلیمی ایران به روش کوپن-گایگر در سده بیست و یکم', مجله ژئوفیزیک ایران, 11(1), pp. 84-100. رضیئی, طیب. چشم‌اندازی از مناطق اقلیمی ایران به روش کوپن-گایگر در سده بیست و یکم. مجله ژئوفیزیک ایران, 1396; 11(1): 84-100. در این پژوهش از میانگین دمای ماهانه CRU، میانگین بارش ماهانه GPCC در دوره­های آماری 1951-2000 و داده‌های دما و بارش ماهانه شبیه‌سازی شده TYNSC2.03 در سده بیست و یکم میلادی (دوره 2001-2100) استفاده شده است. برای بررسی جابه­جایی مناطق اقلیمی کشور تحت تأثیر تغییرات اقلیمی پیش­بینی شده برای سده بیست و یکم، از میانگین (Ensemble) اجرای مدل­های اقلیمی HadCM3، NCAR-PCM، CGCM2، CSIRO2 و ECHam4 برای چهار سناریو A2، B1، B2 وA1F1 استفاده شد. با استفاده از روش کوپن-گایگر، منطقه­بندی اقلیمی ایران برای دوره­های آماری 1951- 2000، 1976-2000 (سده بیستم) و چهار دوره 25 ساله 2001- 2025، 2026-2050، 2051- 2075 و2076-2100 (سده بیست یکم) انجام و با یکدیگر مقایسه گردید. مقایسه نقشه­های اقلیمی دو دورة 1951- 2000 و1976- 2000 نشان از جابه­جایی­گروه‌های اقلیمی در برخی از مناطق کشور (شمال­غرب) دارد که در آن اقلیم برفی و معتدل جای خود را به اقلیم نیمه بیابانی سرد داده است. در مناطق مرکزی و شرقی کشور نیز اقلیم بیابانی سرد به اقلیم بیابانی گرم تبدیل شده است. نتایج به دست آمده­ از سناریو­های مختلف نیز نشان از گسترش اقلیم بیابانی گرم در ایران مرکزی و گرایش شدید شمال غرب ایران به سوی بیابانی شدن دارند. این جابه­جایی­ها در سناریو بدبینانه­تر A1F1 به شکل گسترده­تری صورت خواهد پذیرفت. بر اساس این سناریو در نیمه دوم سده بیست و یکم قلمرو اقلیم معتدل Csb در غرب ایران به کوچکترین سطح ممکن خواهد رسید و این اقلیم بشدت به سوی عرض­های جغرافیایی شمالی‌تر و مرزهای غربی کشور پسروی خواهد کرد و جای خود را به اقلیم نیمه­بیابانی سرد و یا اقلیم نیمه­بیابانی گرم خواهد داد. در بخش­های گسترده­ای از منطقه کوهستانی غربی و شمال­شرقی ایران نیز اقلیم نیمه­بیابانی سرد جای خود را به اقلیم نیمه­بیابانی گرم خواهد داد. این جابه­جایی‌ها بویژه در دوره 25 ساله پایانی سده بیست و یکم به صورت گسترده­تری روی خواهد داد و در پایان این دوره اقلیم نیمه­ بیابانی گرم بر تمامی منطقه کوهستانی غربی و شمال­شرق ایران چیره خواهد شد و اقلیم نیمه بیابانی سرد را به عرض­های بالاتر از 35 درجه جغرافیایی پس خواهد راند. The impacts of potential climate change on the surface climate variables can be appraised through the projections of the global circulation onto the target variables, considering that the observed climate shifts are commonly associated with the changing patterns of the general circulations (Fraedrich et al, 2001). Since a combination of climate variables are utilized to develop climate classification schemes, they are useful for validating the outputs of the general circulation models (GCMs). The Köppen climate classification (Köppen, 1936), as the widely used climate classification method, is well suited for simultaneously validating the temperature and precipitation model outputs, considering that it takes into account both precipitation and the near-surface air temperature as the major input variables, as well as their annual cycles and linkage with the natural vegetation patterns (Kalvova et al, 2003). Therefore, such a climate classification allows for an outlook on the possible future shifts in the climate zones under a changing climate. Many researchers applied the Köppen climate classification to the general circulation model outputs in order to assess the shifts in the climate zones caused by the foreseen climate changes, represented by the GCMs (Fraedrich et al, 2001; Diaz and Eischeid, 2007; De Castro et al, 2007; Ruble and Kottek, 2010; Chen and Chen, 2013; Chan et al, 2016; Engelbrecht and Engelbrecht, 2016). The present work aimed at investigating the shifts in the Iranian climate zones induced by the possible climate changes in the 21st century. Monthly total precipitation of the Global Precipitation Climatology Centre (GPCC) and the mean monthly temperature of the Climatic Research Unit (CRU) of the University of East Anglia, both having 0.5 degree spatial resolution, were used for computing present time (1951-2000 time period) Köppen-Geiger climate classification for Iran. Following Rubel and Kottek (2010), the global temperature and precipitation projections corresponding to the period 2001 to 2100 were also taken from the Tyndall Centre for Climate Change Research dataset, TYNSC2.03 (Mitchell et al., 2004), to compute Köppen-Geiger climate classification for the 21st century. The TYNSC2.03 consists of a total of 20 GCM runs, combining 4 possible future worlds of emission scenarios (A2, B1, B2, A1F1) described by SRES (ARNELL et al., 2004) with 5 state-of-the-art climate models, namely the Hadley Centre Coupled Model Version 3 (HadCM3), the National Center for Atmospheric Research-Parallel Climate Model (NCARPCM), the Second Generation Coupled Global Climate Model (CGCM2), the Industrial Research Organization-Climate Model Version 2 (CSIRO2) and the European Centre Model Hamburg Version 4 (ECHam4). The Köppen-Geiger climate types of the present time were computed on the basis of the GPCC precipitation and CRU temperature datasets for 1951-2000 and 1976-2000 time periods. The 21st century Köppen-Geiger climate types were further computed for 1901-1925, 1926-1950, 1951-975 and 1976-2100 time sections of the TYNSC2.03 datasets. The comparison of the climate classifications of 1951-2000 and 1976-2000 time periods highlighted certain signals of change in the Iranian climate zones in the latter half of the 20th century. The most obvious changes were the tendency of northwestern Iran to a drier climate and the extensive retreatment of BWk climate type in the central and eastern Iran in favor of BWh climate type in the last quartile of the 20th century. Shifts and changes in the climate zones of Iran were more profoundly observed in the climate classification maps of the 21st century, particularly in the final quarter of the century. Except for A2 and A1F1 pessimistic scenarios which showed the maximum climate shifts in Iran, all the scenarios considered in this study more or less agree in displaying moderate changes in the climate zones of Iran. In general, based on the pessimistic scenarios, northwestern Iran is extremely susceptible to an extensive climate shift in the future. Nevertheless, all the scenarios indicate that northwestern Iran tends to have a much drier and warmer climate in the second half of the 21st century. Moreover, the Csb climate type, currently the main climate type of most parts of the Zagros mountainous areas of western Iran, will be replaced by Bsk and Bsh climate types at the end of the 21st century. Obviously, the BWk climate type will disappear from the country at the end of the century due to the widespread invasion of the BWh climate type in the central and eastern Iran, indicating an anticipated widespread desertification in almost all parts of the country, particularly in the northwest of Iran, under a changing climate. خلیلی،ع.، حجام، س.، و ایران‌نژاد، پ.، 1370، تقسیمات آب و هوایی ایران: انتشارات وزارت نیرو، طرح جامع آب کشور (جاماب)، 259 صفحه و یک نقشه با مقیاس یک میلیونیم. رضیئی، ط.، 1396، منطقه‌بندی اقلیمی ایران به روش کوپن-گایگر و بررسی جابه­جایی مناطق اقلیمی کشور در سده بیستم: مجله فیزیک زمین و فضا (آماده انتشار). عدل، ا.ح.، آب و هوای ایران: 1339، انتشارات دانشگاه تهران. گنجی، م.ح.، 1353، 32 مقاله جغرافیایی: مؤسسه جغرافیایی و کارتوگرافی سحاب. 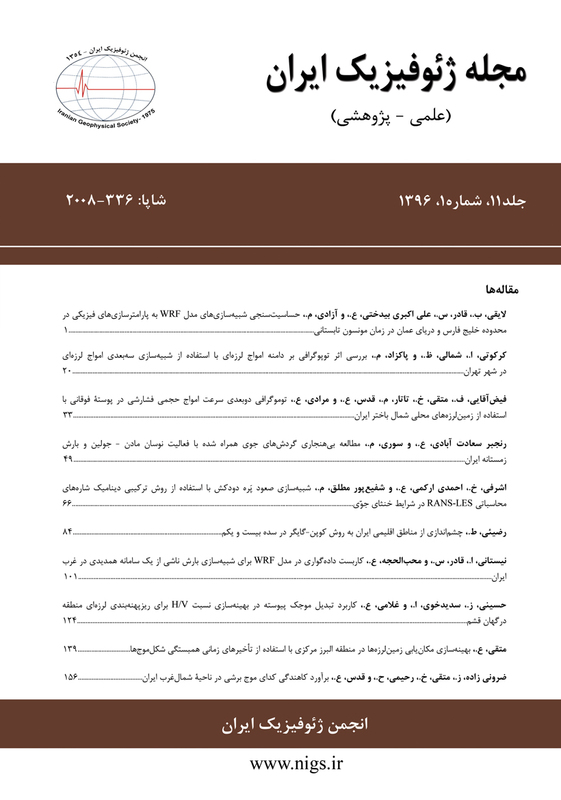 تهران، 101-139. مسعودیان، س.ا.، و کاویانی، م.ر.، 1387، اقلیم شناسی ایران: انتشارات دانشگاه اصفهان، 179 صفحه. میری، م.، رضیئی، ط.، و رحیمی، م.، 1395، ارزیابی و مقایسه آماری داده‌های بارش TRMM و GPCC با داده‌های مشاهده‌ای در ایران: مجله فیزیک زمین و فضا، 42(3)، 657-672. Achberger, C., Linderson, M. L., and Chen, D., 2003, Performance of the Rossby centre regional atmospheric model in Southern Sweden: comparison of simulated and observed: Theoretical and Applied Climatology, 76, 219–234. Arnell, N. W., Livermore, M. J. L., Kovats, S., Levy, P. E., Nicholls, R., Parry, M. L., and Gaffin, S. R., 2004, Climate and socio-economic scenarios for global scale climate change impacts assessments: Characterising the SRES storylines, Global Environmental Change, 14, 3–20. Chan, D., Wu, Q., Jiang, G., and Dai, X., 2016, Projected Shifts in Köppen Climate Zones over China and Their Temporal Evolution in CMIP5 Multi-Model Simulations: Advances in Atmospheric Sciences, 33, 283–293. Chen, D., and Chen, H. W., 2013, Using the Köppen classification to quantify climate variation and change: An example for 1901–2010, Environmental Development, 6, 69-79. Christensen, J. H., and Kuhry, P., 2000, High-resolution regional climate model validation and permafrost simulation for the East European Russian Artic: Journal of Geophysical Research 105(D24):29647–29658. De Castro, M., Gallardo, C., Jylha, K., and Tuomenvirta, H., 2007, The use of a climate-type classification for assessing climate change effects in Europe from an ensemble of nine regional climate models: Climatic Change, 81, 329–341. Diaz, H. F., and Eischeid, J. K., 2007, Disappearing alpine tundra Köppen climatic type in the western United States: Geophysical Research Letters 34, L18707, http://dx.doi.org/10.1029/2007GL031253. Djavadi, C., 1966, Les climats de l'Iran: Monographies de la météorologie nationale, France, 54, 103 p.
Engelbrecht, C. J, and Engelbrecht, F. A., 2016, Shifts in Köppen-Geiger climate zones over southern Africa in relation to key global temperature goals: Theoretical and Applied Climatology, 123, 247–261. Fraedrich, K., Gerstengarbe, F. W., and Werner, P.C., 2001, Climate shifts during the last century: Climatic Change, 50, 405–417. Guetter, N. E., and Kutzbach, J. E., 1990, A modified Koeppen classification applied to model simulations of glacial and interglacial climates: Climatic Change, 16, 193–215. Kalvová, J., Halenka, T., Bezpalcová, K., and Nemešová, I. 2003, Köppen climate types in Observed and simulated climates: Studia Geophysica et Geodaetica., 47, 185−202. Kim, H. J., Wang, B., Ding, Q., and Chung, I. U., 2008, Changes in arid climate over North China detected by the Köppen climate classification: Journal of Meteorological Society of Japan, 86 (6), 981–990. Kleidon, A., Fraedrich, K., and Heimann, M., 2000, A green planet versus a desert world: Estimating the maximum effect of vegetation on the land surface climate: Climate Change, 44, 471–493. Köppen, W., 1936, Das geographische System der Klimate. In: Köppen W, Geiger R (eds) Handbuch der Klimatologie. Gebrüder Borntraeger, Berlin, 1−44. Kottek, M., Grieser, J., Beck, C., Rudolf, B., and Rubel, F., 2006, World Map of the Köppen–Geiger climate classification updated: Meteorologische Zeitschrift, 15(3), 259–263. Lohmann, U., Sausen, R., Bengtsson, L., Cubasch, U., Perlwitz, J., and Roeckner, E., 1993, The Köppen climate classification as a diagnostic tool for general circulation models: Climate Research, 3, 177–193. Mitchell, T. D., and Jones, P. D., 2005, An improved method of constructing a database of monthly climate observations and associated high-resolution grids: International Journal of Climatology, 25, 693–712. T. A., 2007, Updated world map of the Köppen-Geiger climate classification: Hydrology and Earth System Sciences, 4, 439–473. Peel, M. C., Mcmahon, T. A., Finlayson, B. L., and Watson, F. G. R., 2001, Identification and explanation of continental differences in the variability of annual runoff: Journal of Hydrology, 250, 224–240. Rahimi, J., Ebrahimpour, M., and Khalili, A., 2013, Spatial changes of extended De Martonne climatic zones affected by climate change in Iran: Theoretical and Applied Climatology, 112, 409–418. Rubel, F., and Kottek, M., 2010, Observed and projected climate shifts 1901–2100 depicted by world maps of the Koppen- Geiger climate classification: Meteorologische Zeitschrift, 19, 135–141. Schneider, U., Fuchs, T., Meyer-Christoffer, A., and Rudolf, B., 2008, Global precipitation analysis products of the GPCC: Global Precipitation Climatology Centre (GPCC), DWD, Internet Publication (http://www.dwd.de), 1–12. Sparovek, G., De Jong Van Lier, Q., and Dourado Neto, D., 2007, Computer assisted Koeppen climate classification: a case study for Brazil: International Journal of Climatology, 27, 257–266. Stern, H., de Hoedt, G., and Ernst, J., 2000, Objective classification of Australian climates: Australian Meteorological Magazine, 49, 87–96. Wang, M., and Overland, J. E., 2004, Detecting Arctic climate change using Köppen climate classification: Climatic Change, 67, 43–62. Ying, S., Xue-Jie, G., and Jia, W., 2012, Projected Changes in Köppen Climate Types in the 21st Century over China: Atmospheric and Oceanic Science Letters, 5:6, 495-498.